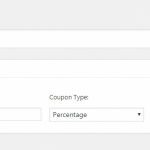 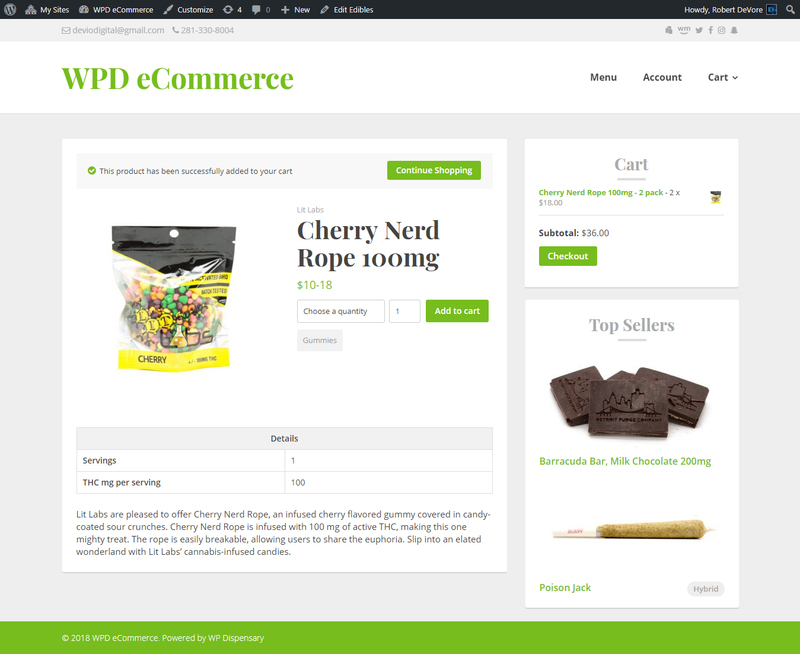 Our new eCommerce add-on turns your website into an online sales machine! 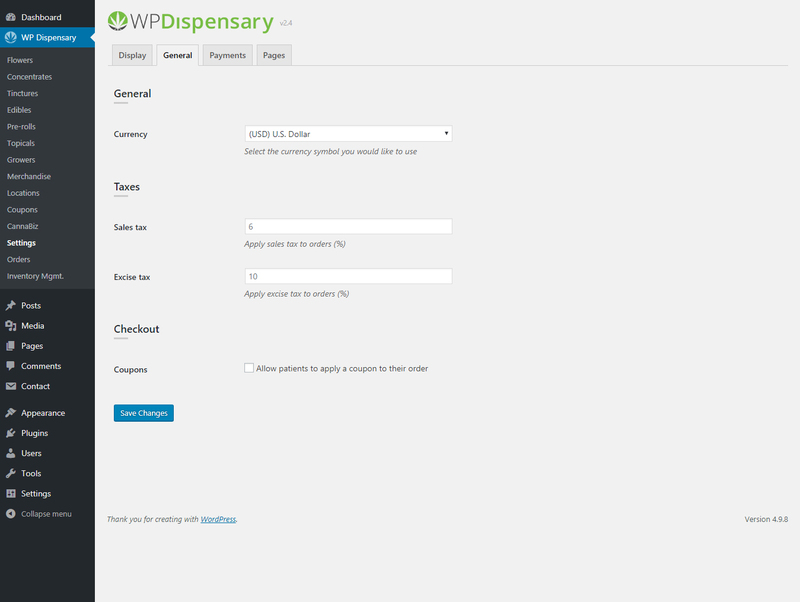 It’s been three years since WP Dispensary version 1.0 was officially released. 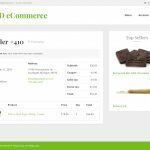 Happy birthday to us – and happy birthday to YOU, because today we’re celebrating by releasing our new eCommerce add-on. 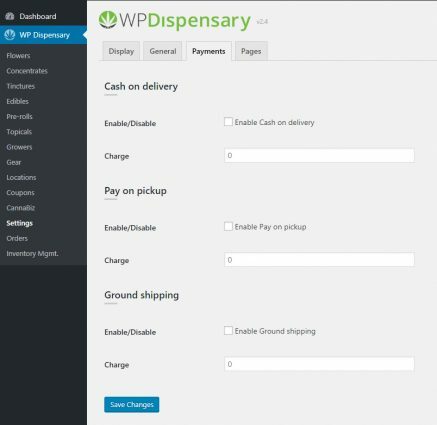 From it’s humble beginnings in 2015, WP Dispensary has set out to be one thing – the #1 online menu solution for dispensaries and delivery services. 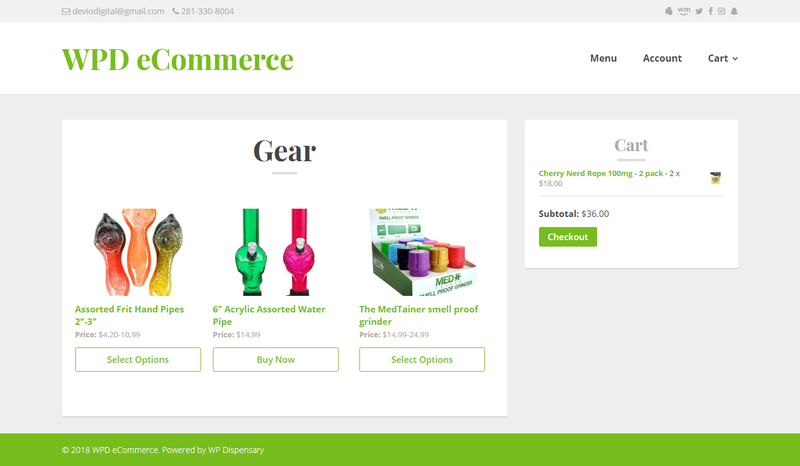 The release of our official eCommerce add-on turns a page in our history book and marks the start to our next chapter. 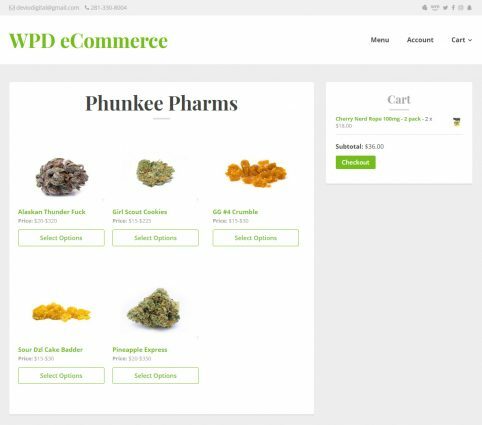 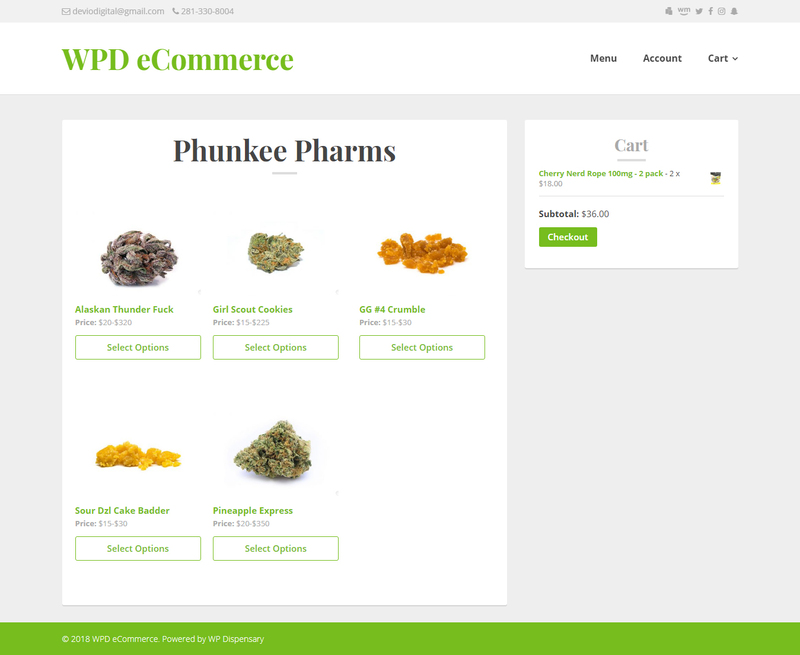 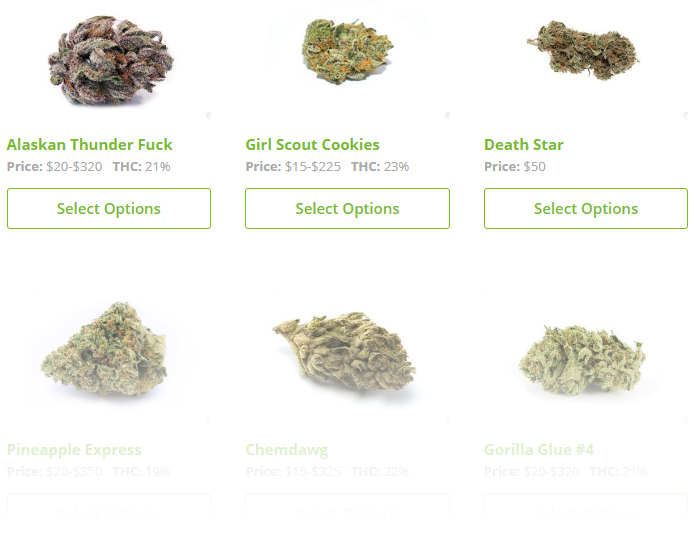 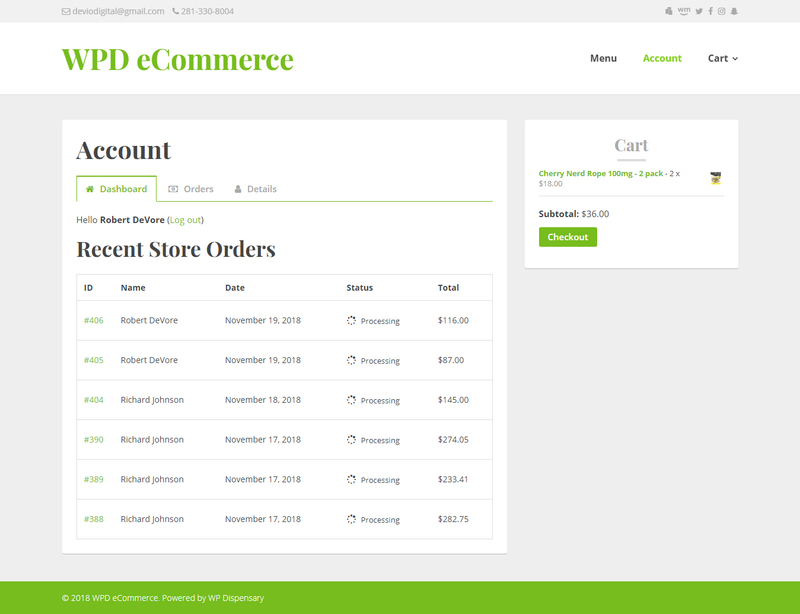 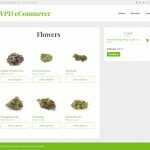 Switching from the Connect for WooCommerce to our own eCommerce solution means that WPD is now one step closer to becoming your complete online dispensary menu solution. 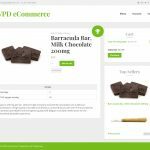 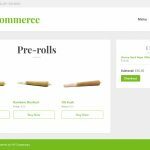 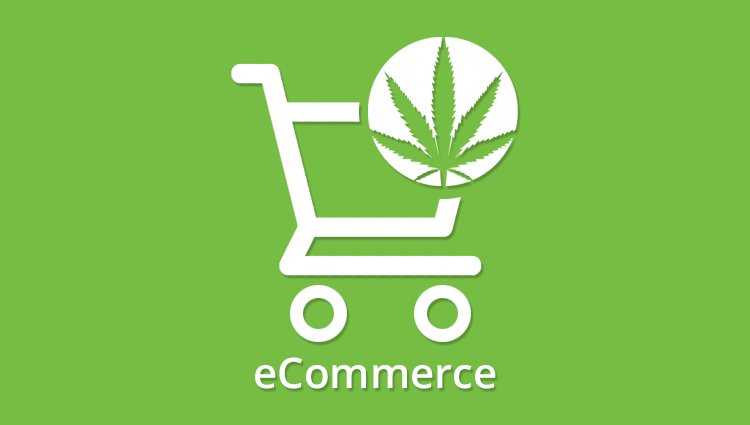 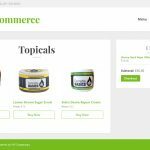 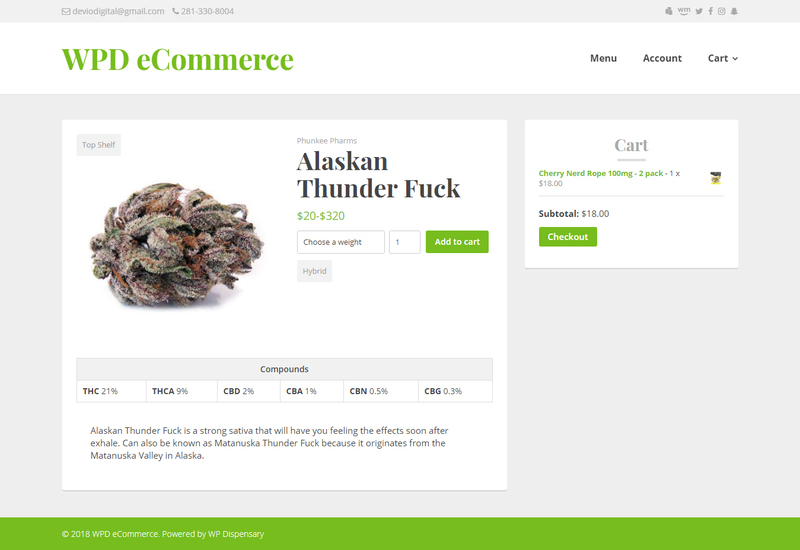 Our eCommerce plugin is packed with a ton of great features that will give customers a seamless online shopping experience while increasing your cannabusiness bottom line and streamlining your operations. 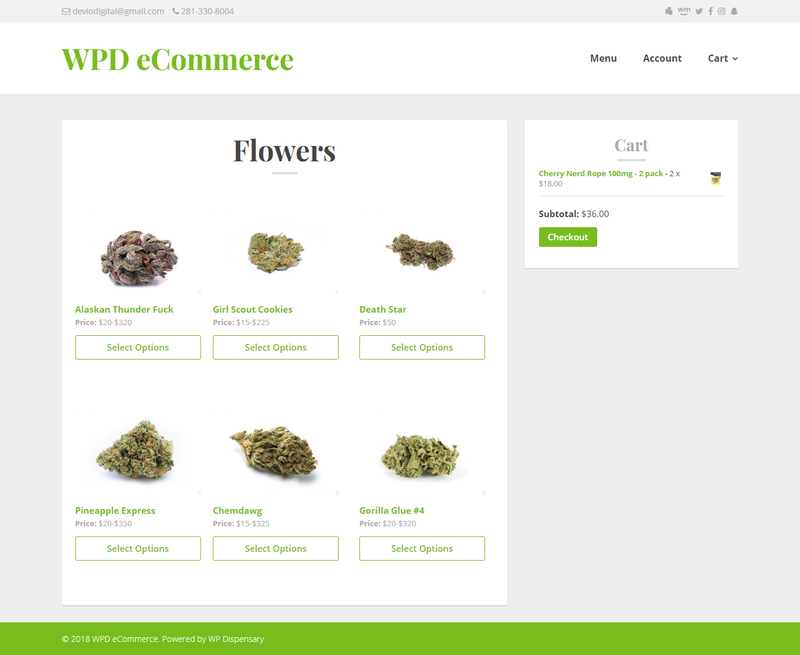 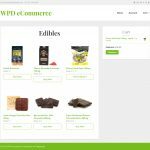 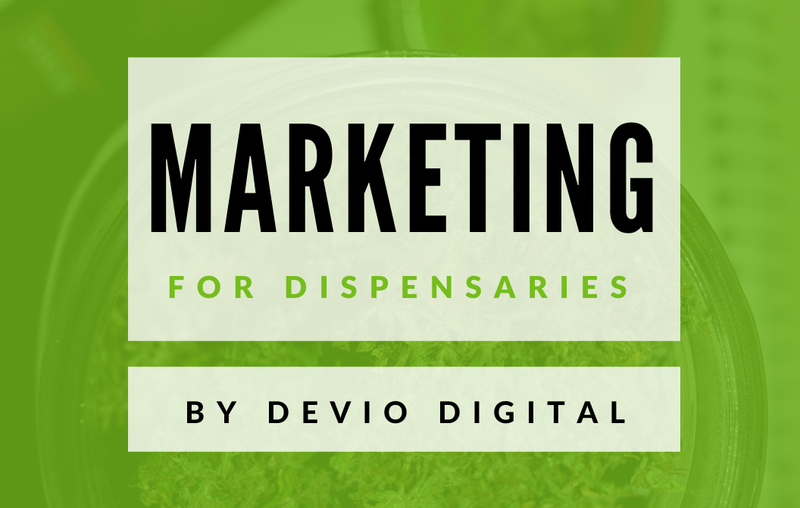 If you already have a menu set up with WP Dispensary, you’ll be able to activate the eCommerce plugin and instantly turn your menu into an online sales machine! 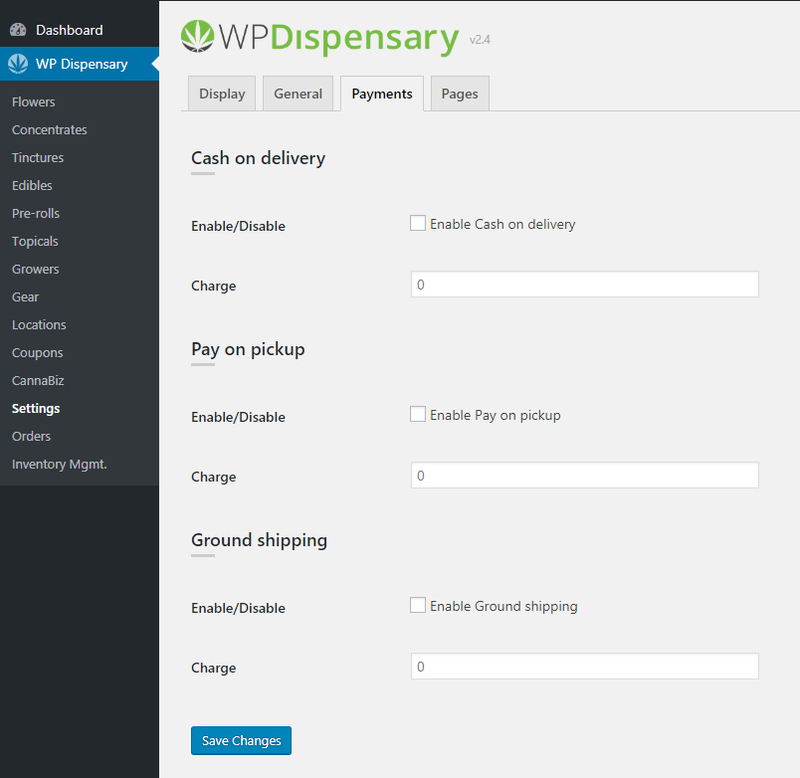 There are two payment types included with WP Dispensary’s eCommerce solution, and those are Cash on delivery and Pay on pickup. 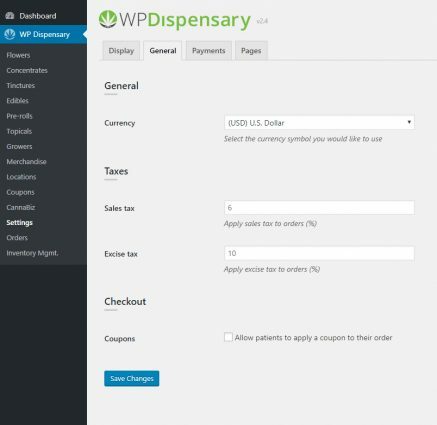 By adding a sales tax and excise tax in your WP Dispensary admin settings, your orders can automatically calculate both taxes and order total so customers know exactly what they’ll be paying – and you have clear and easy to read records of each order. 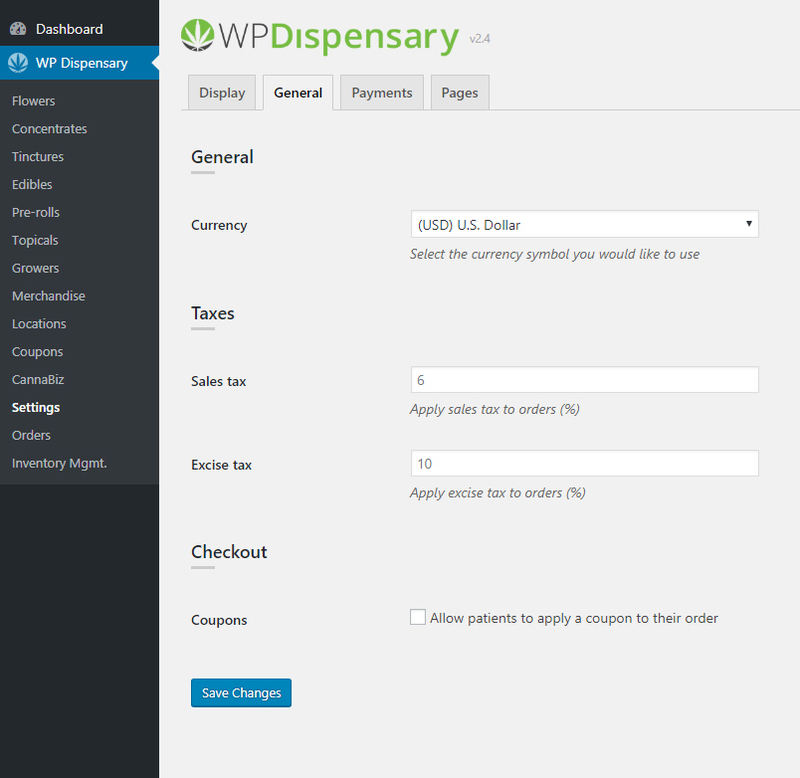 In your admin dashboard, you’ll now notice an Orders submenu item in the WP Dispensary tab. 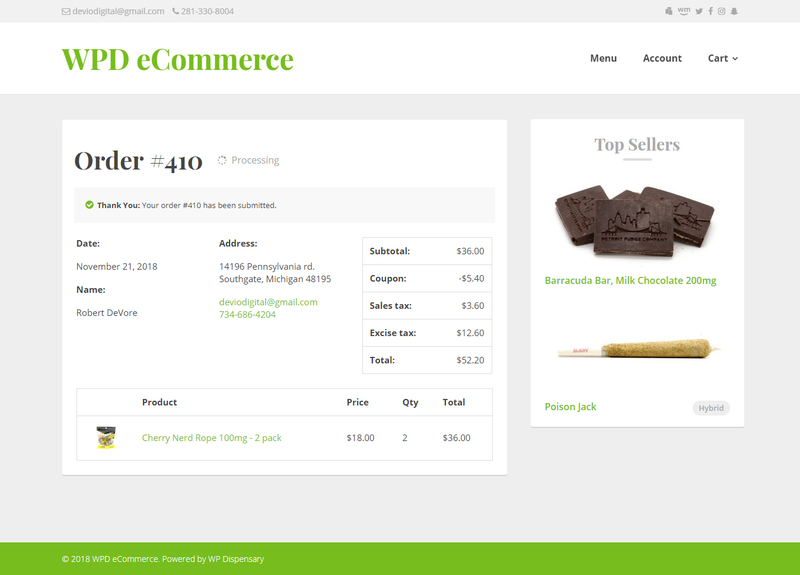 This gives you an instant overview of the order number, customer name and order status. 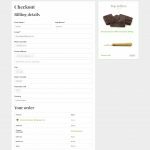 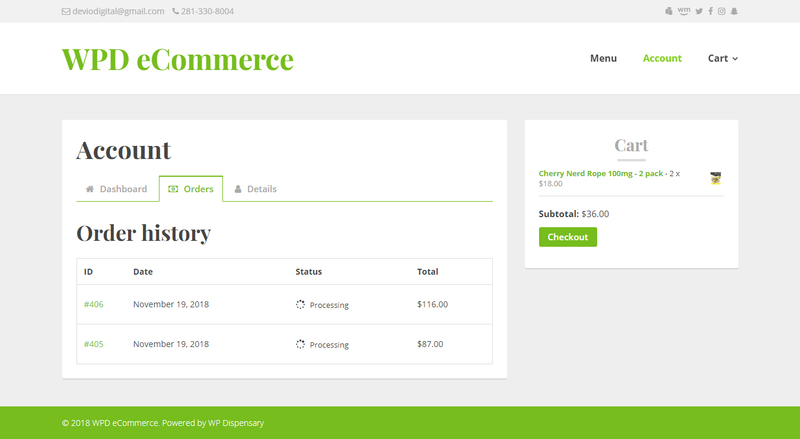 Clicking into an order will give you a full view of the order details, including order status, customer information, order items and order charges. 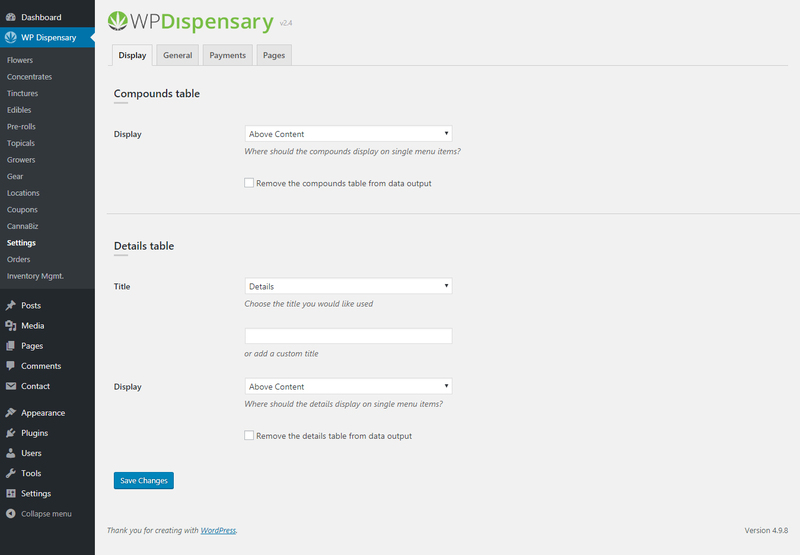 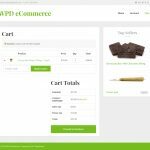 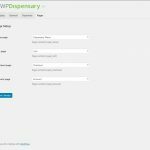 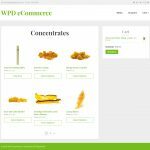 Not only are there a ton of features built into the WP Dispensary eCommerce plugin, but there are also new templates for single products and menu type archives. This means that when someone wants to view all of your Flowers, they can go to example.com/flowers and this will display a clean and easy to browse menu (demo link). 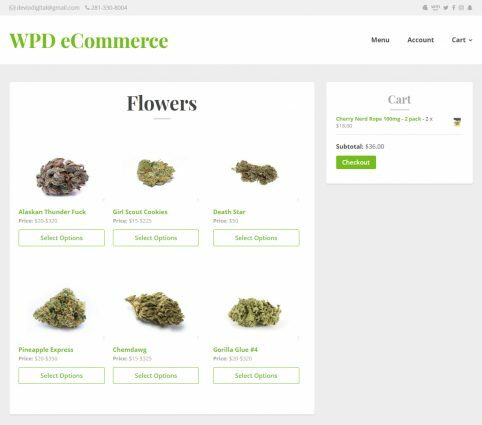 This also means that if someone wants to browse all of the products that you have from a specific vendor, they can click the vendor name and view all products in the same style layout (demo link). 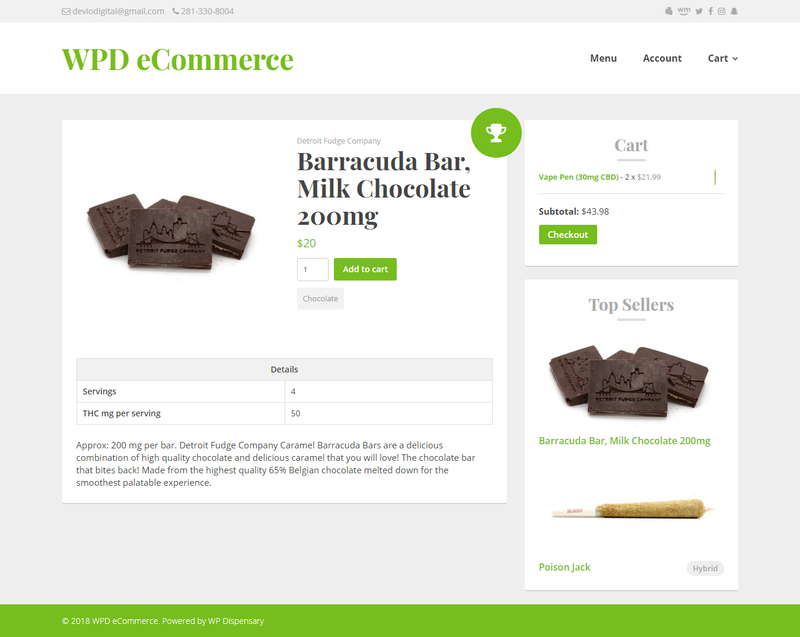 Your single product page is also updated with a new template which includes the add to cart functionality as well as a face lift to display your products details in style (demo link). 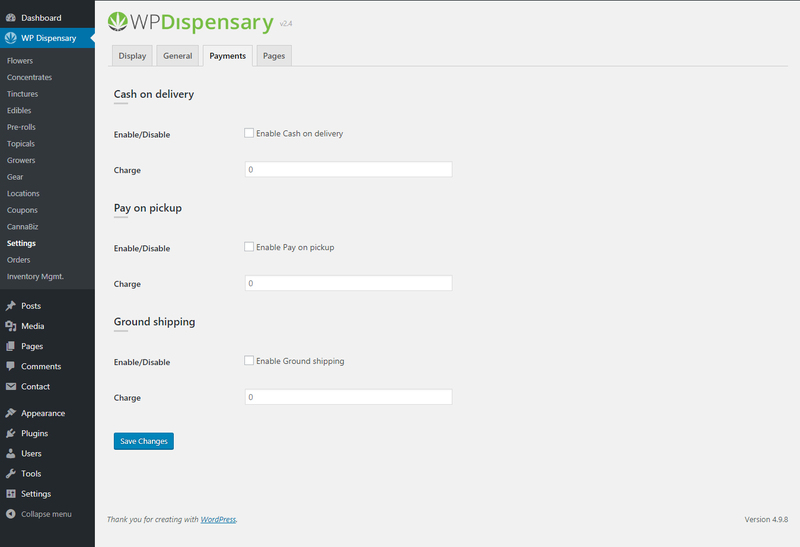 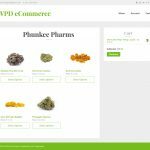 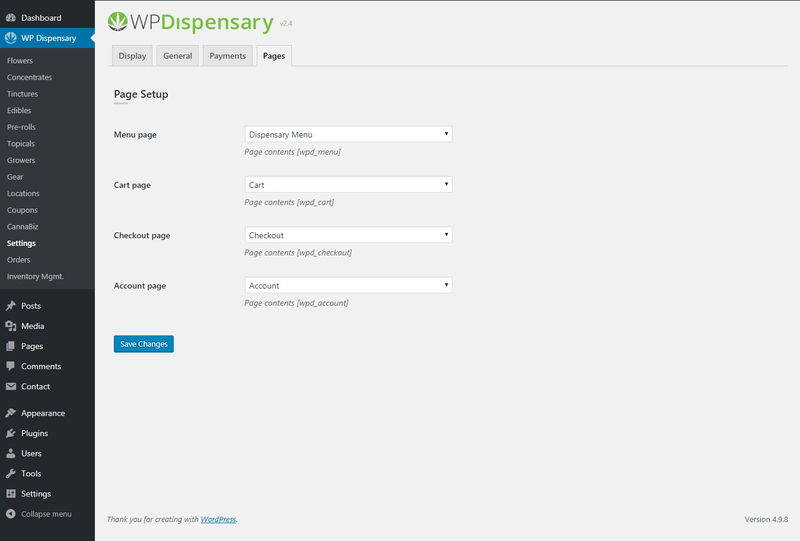 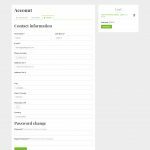 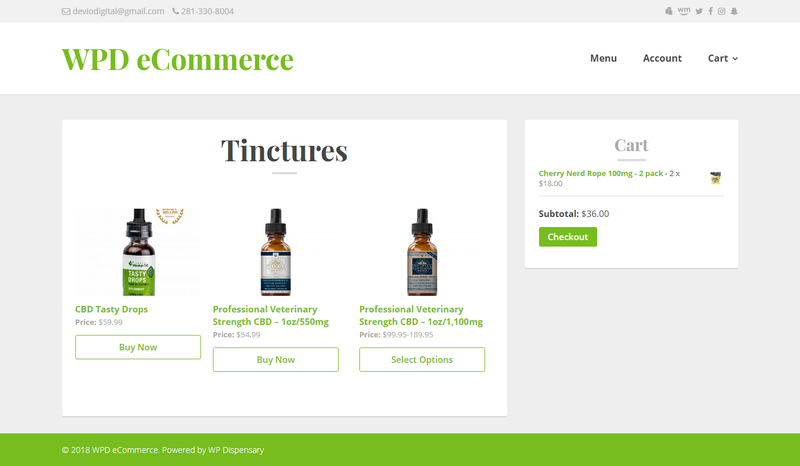 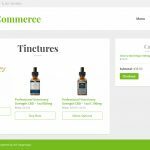 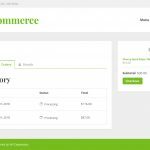 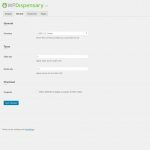 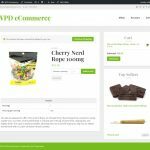 We have the Dispensary Details for WooCommerce plugin which adds many of the features in WP Dispensary to shops built with WooCommerce. 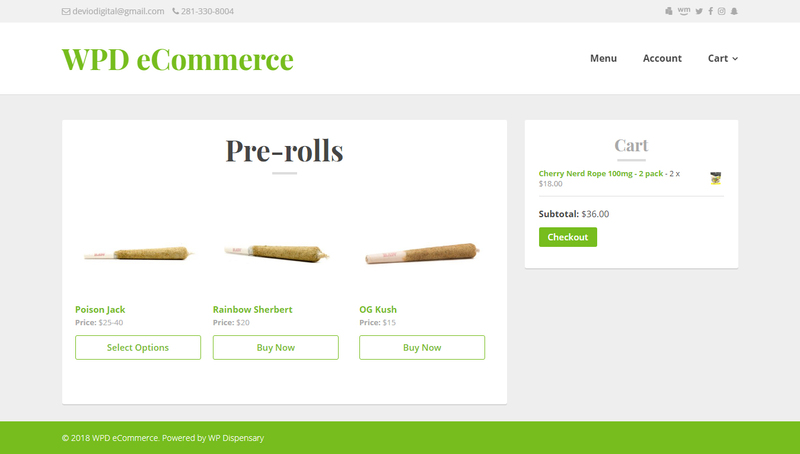 This plugin will continue to be updated (a new release is pending as I write this) and serve dispensaries and delivery services who already have WooCommerce shops built but need cannabis industry specific features. 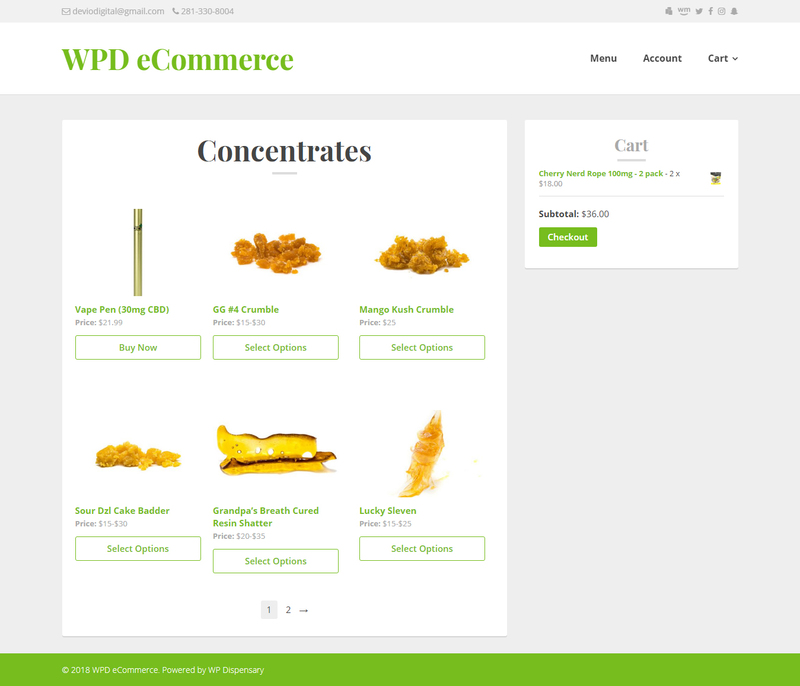 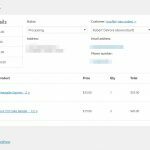 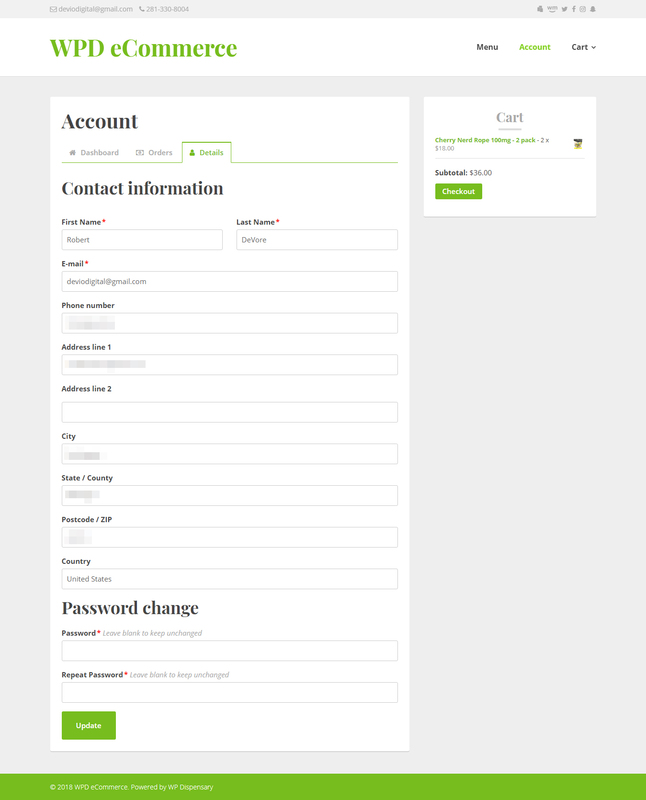 We also have the Connect for WooCommerce add-on which is being discontinued. 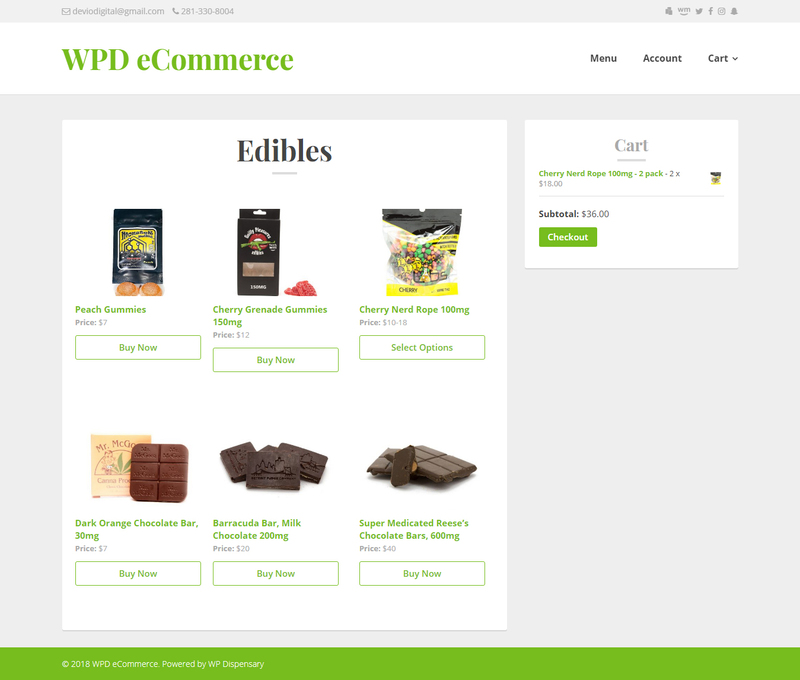 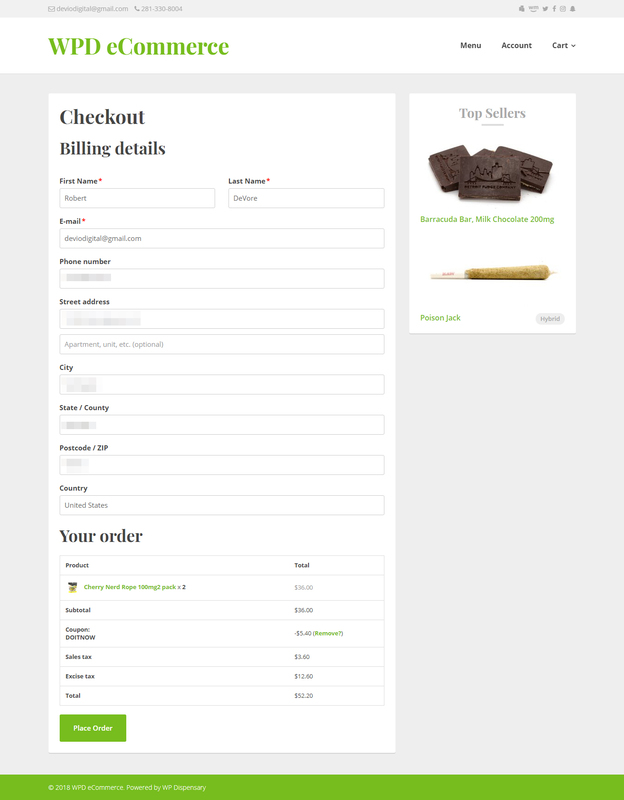 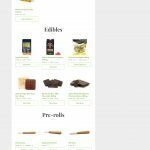 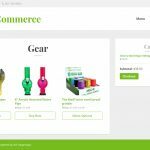 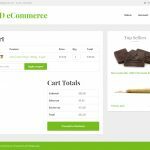 While I love WooCommerce and am thankful that it was able to power WP Dispensary’s online ordering up to this point, it does not make sense to offer our own eCommerce solution while still offering a connection to another eCommerce plugin. 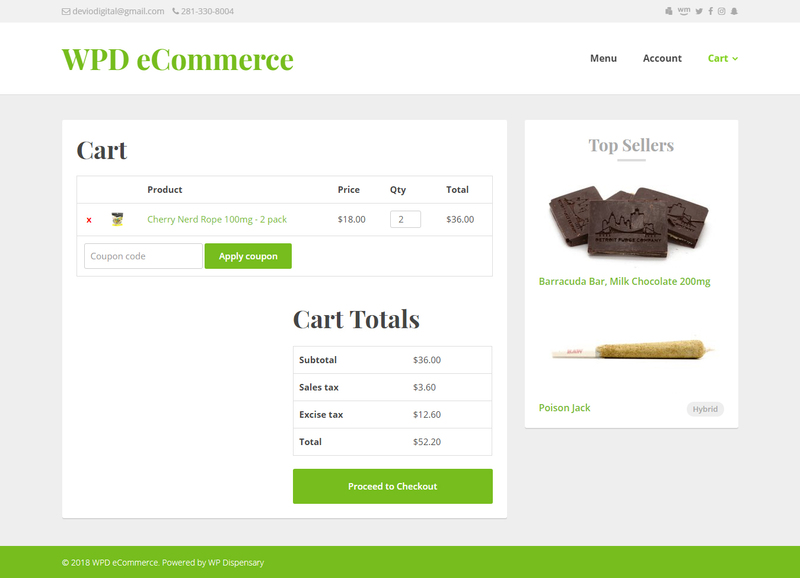 You can view a live demo of the eCommerce plugin in action here. 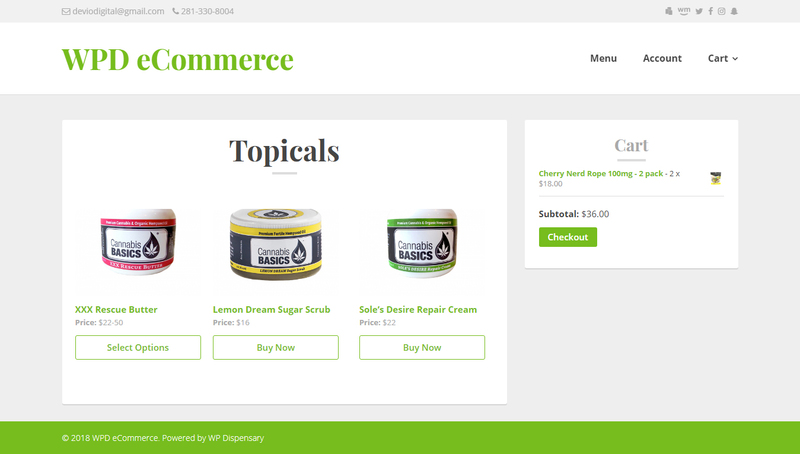 You can also see screenshots from the eCommerce plugin in the gallery below. 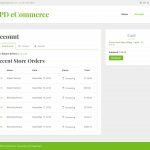 You can purchase your copy of the eCommerce add-on from the product page and receive an instant download. 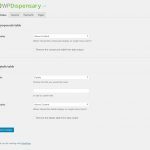 As always, thank you for your continued support of WP Dispensary – I appreciate you! 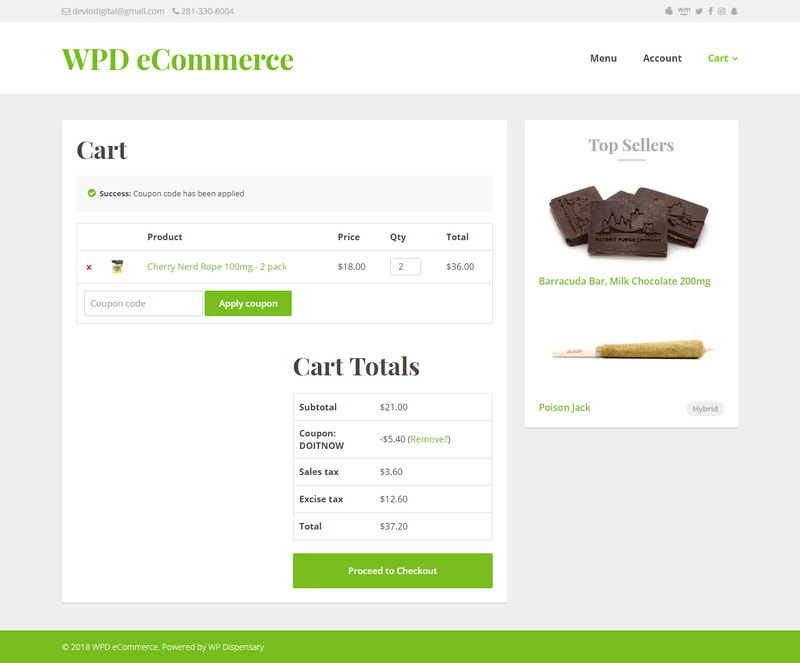 And since it’s both WPD’s 3rd birthday AND Cyber Monday, you can use the coupon code CYBER2K18 and save 40% on your order!